Gutter King specializes in gutter repair in Seattle as well as gutter cleaning and installation of continuous 4'', 5'' and 6'' K-Style, 6" Fascia, and Half-Round gutters offered in aluminum, steel, and copper with color options to accentuate any home. We provide installation, repair, and cleaning services across the greater Seattle area from King County to Island County, Snohomish county, and over across to Bellevue and the Eastside. 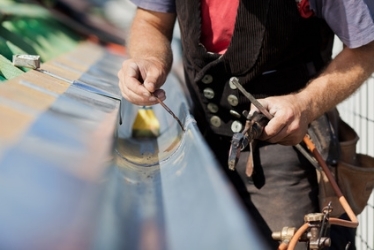 When you want the best selection, service and value in the seamless rain gutter business, call Gutter King. Thousands of homeowners and contractors across King, Snohomish, and Island counties have discovered the Gutter King difference over the past 25 years. Gutter King is licensed, bonded and insured . We provide a five-year warranty on our workmanship on all of our installations. Our aluminum gutters carry up to a 40-year warranty. We will form the gutters according to your specifications, end caps sealed and all! Trap-door strainers, downspout strainers, gutter guards and heavy duty installation hangers.